One glitch and thousands of cardholders across the UK were wrongly charged twice for card payments made on Wednesday 29th August 2018. To make matters worse, receipts did not reflect the double-charge, forcing countless of unsuspecting customers into their overdraft. By the time the double-charge came to light, consumers had to wait until Monday to dispute it - both with the retailer, then with the bank. Anyone who made a card payment last Wednesday should check their statements immediately. Cardnet, the card payments network company that processes 1.2 billion transactions across 75,000 terminals annually has much to answer for. Regardless of which card was used, or from what bank the account is held, the glitch impacted transactions conducted through Cardnet payment terminals (frequently used in shops, restaurants, businesses etc). Yet, customers have still been reporting their missing refunds all week. Cardnet® is a joint venture between Lloyds Bank and First Data. A Lloyds Banks Group also said that their customers had been refunded, but the stream of Tweets reporting otherwise contradict both statements. Sadly, this is not the first significant card network fail that victimized card users this summer... and it may not be the last. Although Lloyds Bank released a statement saying that less than 5% of consumers were affected, the cashless incident comes at a time when debit card-use surpasses cash-use in the UK. Suddenly, that percentage doesn't seem so harmless. The silver lining is that being on the receiving end of a glitch like this may remind the public of the importance of keeping glitch-free cash around. Twitter users have addressed Visa, Cardnet, Lloyds Bank and specific retailers in their search for answers. Merchants themselves have also requested explanations on behalf of their customers. Even if each duplicate charge is repaid, there will still be a loss incurred by the company's that must wave each transaction fee due to the bug. More importantly, the days of distress experienced by the paycheck-to-paycheck portion of those affected cannot be compensated for. The reputation of establishments that rely on word-of-mouth publicity will also take a hit as customers vent their frustration. Inevitably, there will also be unaware victims who won't notice because their blind reliance on 'convenient payment technology' has left them psychologically unaccustomed to keeping tabs on their spending. Should that mean that they deserve to lose their hard-earned money? For a sector that runs on public trust, this is a betrayal they should not be able to afford. 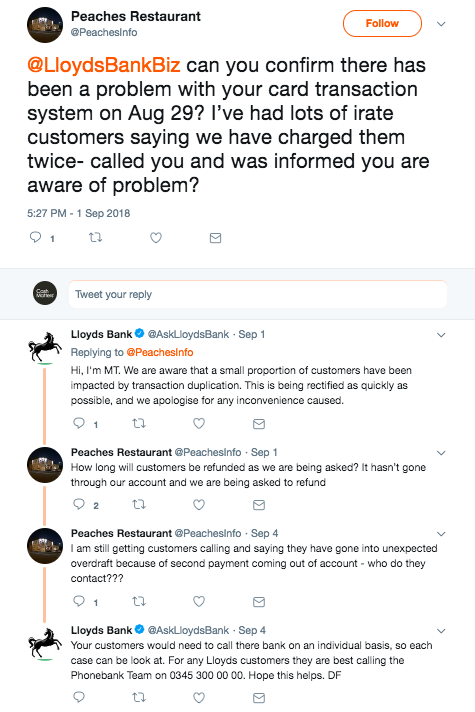 These troubles don't stop with Lloyds Bank customers, though. The majority of affected transactions occurred with Visa cards. This is the second time this summer that Visa card users are left stranded because of a mass network glitch. One very influential Chicago Alderman fought against Visa's #CashlessChallenge campaign by reminding Americans that it is unconstitutional to refuse American cash. In response, Visa shamelessly backtracked by saying their campaign did not demand merchants to refuse cash entirely. However, it would be too generous to describe the challenge a suggestion. Also, a councilman in Washington DC submitted a bill that would make it illegal for food retailers to refuse cash. In the case of Francesca Brady, who purchased a Mercedes car that fateful day, incurred a double-charge that left her £16k into her overdraft, facing large fees and experiencing a weekend of financial panic. Has the double-charge glitch affected you? If so, please share your story with us through an email to info@cashmatters.org or message us via Twitter/Facebook/Instagram/LinkedIn @CashMattersOrg. Many people banking with different organizations were charged twice for spending money in shops, restaurants, and businesses using Cardnet terminals as their way of taking payment.